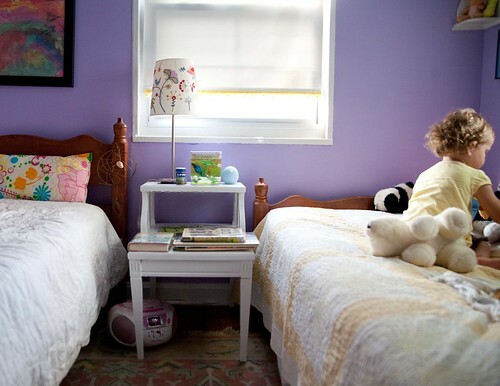 My daughters’ shared bedroom has been through many phases. I enjoy the creative DIY challenge of making this small, 8×10 bedroom with two windows work for my two growing girls. Our space saving solutions so far have been to remove the closet door, put one dresser inside the closet for Nadja (age 3), and store Ana’s (age 7) clothes in baskets under her bed. We hang their dresses together in the closet too. We’re using the maple bunk beds my husband and his brother used as children, but we decided to take them apart and put them side by side. Ana hated sleeping in the upper bunk. She felt it was too hot even with a fan blowing on her. This was a counterintuitive choice because even though the beds take up more floor area now, and one sits higher than the other, we no longer block a window and the room has more natural light. 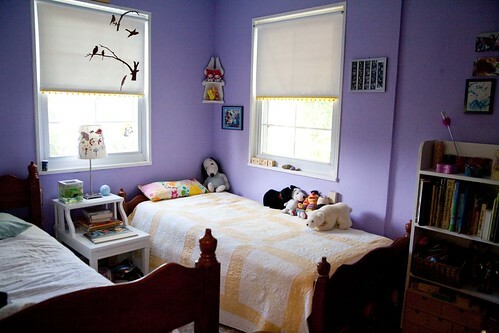 We can put more storage bins under the beds, and showing more of the walls makes the room seem bigger. Perhaps the best outcome is that the girls now have their own sides of the room to claim as their own. The wool area rug, which was one we used in our living room in a previous apartment is primarily coral and tan, with some light blue and yellow. I like coral and purple together, so the overall color scheme works well. We had a vintage distressed yellow dresser in an earlier version of the room, but the room felt cramped. We moved the dresser into a closet in the basement to store winter woolens and duvets. Ana stores her clothes in baskets under her bed now. In place of the dresser, we have a bookshelf I bought at Not Too Shabby Consignments and painted white, a dollhouse in the corner opposite the beds, and dress-up clothes on a rack behind the main door. I also bought shelves at Not Too Shabby Consignments for each girl’s side and painted them white. (Using white helps make the room seem larger too.) Now each girl gets to put their special items on their own shelves. 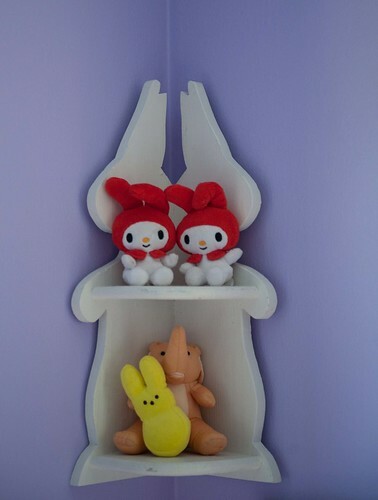 I love Nadja’s bunny shelf. 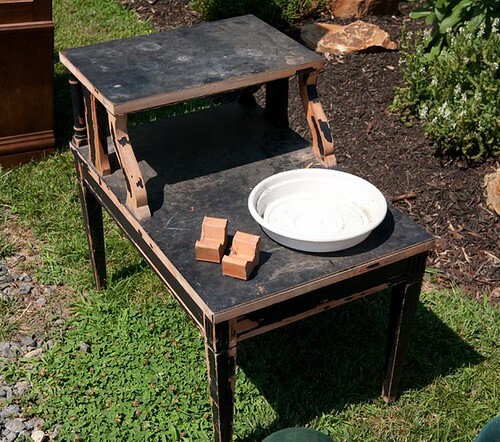 I found this table at a friend’s yard sale. She had meant to paint it to use as a plant stand on her patio, but it was, as I’ll call it, a “DIY Stall.” I took it off her hands, sanded, primed, and painted it white. Read more about that process here. The table works great as the girls’ nightstand and solves the problem we had with the library books at bedtime ending up in a giant pile on the floor. The windows had metal blinds. I freecycled them, removed the hardware, and gave the molding a fresh coat of white paint. 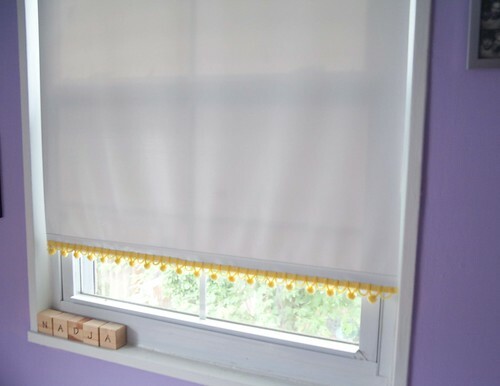 I bought vintage yellow ball fringe on Etsy and a glue gun and then glued the fringe to the bottom edge of the roller blinds. Quick, easy, and I think it adds a nice pop of color to the windows. I realize that the entire room is almost entirely vintage or thrift now. The quilts were passed down. Nadja has my old Snoopy on her bed. Even the mirror on Ana’s side, which hung in our entry way in our last apartment, is vintage; I plan to paint it either white or yellow. I’m also shopping for vintage fitted sheets in a wildflower pattern on Etsy, to keep with the garden theme, which includes a fair number of bunnies and birds. Besides painting clouds on the ceiling and framing Ana’s art, we eventually plan to figure out how to store her clothes a different way rather than in baskets under the bed. This is her main request or as she says, “I’m not going to live getting out of my bed and looking under my bed for my clothes.” So, perhaps we’ll change the closet layout to accommodate both girls’ wardrobes. 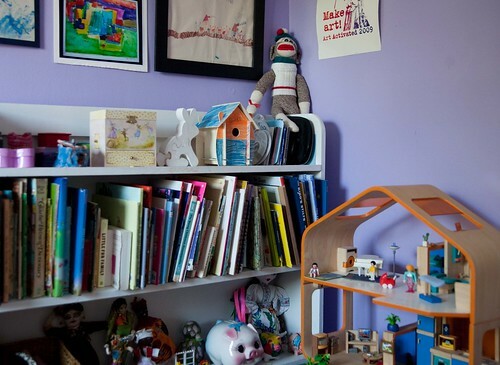 I’d also like to think about a desk/office space for Ana – DIY all the way of course. Love this post! 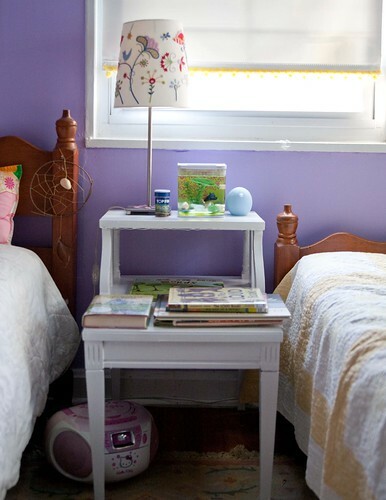 Sweet bedroom and love the refinished nightstand! William’s nursery has clouds painted on a blue ceiling – we inherited it from the previous owners. Feel free to come take a peek if you want to visualize it before you pull out the paintbrush! Jenn, I’d love to see yours. I can’t decide whether to do wispy clouds or full “cumulus” ones. It was definitely a “DIY stall.” You made it look GREAT! So happy it worked for you.